This guide is for you who is new to RoS-BoT. It's recommended to read through it before/while starting for the first time. It aims to guide you through the setup process, as well as give you a little bit of information worth knowing going forward. - Your Windows account is a local/offline account. Not one you login with an e-mail address. - Microsoft .NET needs to be installed and up-to-date. Download from Microsoft here. Windowed fullscreen or Windowed modes are supported. 800x600 is recommended after being proven to both have the best FPS as well as the least amount of UI related bugs. ​In case of Windowed mode; drag D3 window borders/edges to make it the smallest possible size. and not bound using special function keys (like F1, CTRL, SHIFT, ALT, COMMA, SLASH or similar). The easiest way to make sure the above is OK, is to reset everything to Default and then manually set Force Move to Z. Then go over Item Label Display as shown below. downloading and starting up the bot for the first time. - Download RoS-BoT and extract it to a folder of your choice. Just not inside the game folder. - Make sure that Diablo 3 is fully installed and updated. - Make sure that Diablo 3 is not running. - Double-click the Ros-Bot executable. 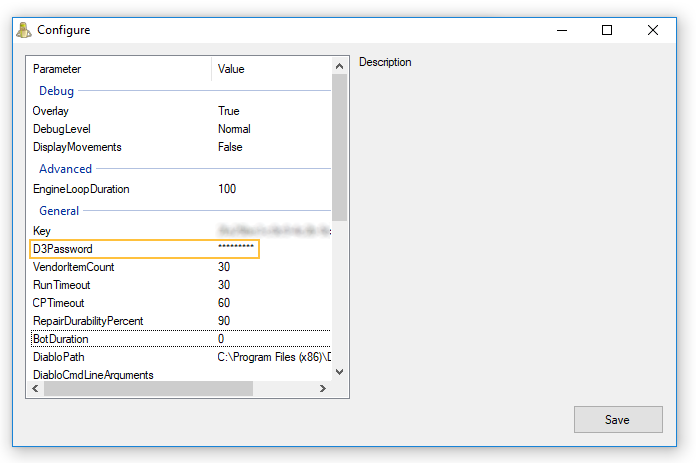 Windows 8/10 users have to run the executable as administrator. Locate Diablo 3 folder. Usually C:\Program Files (x86)\Diablo III, unless you moved/renamed it to say, C:\Diablo3 (recommended). Wait for scenes to be extracted. This can take a few minutes depending on your computer. Add your license key. You will find it under My Account -> Bot Licenses. Copy & paste it. You will be asked to restart RoS-BoT and the program will close. When starting up RoS-BoT again, it will launch Diablo 3. Note: It will launch D3 from a Limited User in Windows, which it created for your safety. Because of this, region and graphical settings will be the default settings and you might want to go over them once more according to this guide's first section above. RoS-BoT doesn't need fancy graphics for it to work, so set it as low as you can manage. Then login to your account. If you want RoS-BoT to be able to relogin after you get disconnected, make sure to enter your D3 password where shown above. This is optional, and RoS-BoT does not send this information to anything but the game itself, when in need. This will cover the basics such as Script, Fastmode, Avoidance, Gambling and Master Profile, as well as our favorite sequence: Rift. For the bot to be able to perform any tasks given to it, it needs input. 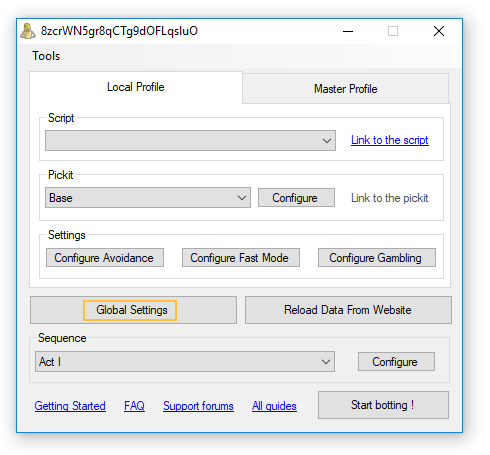 These come in the form of Scripts, Fastmode settings, Avoidance settings, Pickits, Gambling settings and can be bunched together into a Master Profile. Describes to the bot what class you are, what skills your character has, and how/when to use the skills in different situations. Scripts are custom made by users of RoS-BoT, and can be highly tweaked. You'll find them on RoS-BoT.com under Scripts. Pick one you like, based on description or recommendation. You can either Link it to your account which makes it available to your BoT, or you can Replicate it to your account, to be able to change and finetune it. For now, select Link it. The script should include a D3Planner link, so you know what gear to equip and what skills to set in-game on your character. Follow it closely for best performance. Fastmode is when bot is told to ignore mobs until conditions for exiting Fastmode are met. Short explanation is that unless there are X (number/type) of mobs within a set distance, or unless character's health goes below a certain %, the bot ignore the mobs. It can be tweaked to only go after elites, only go after trash, only go after goblins, or a combination of these. Fastmode can be activated for Rifts, Greater Rifts, Bounties, etc. For now, check the script's description for a link to the Fastmode recommended. Click it and replicate it to your account. 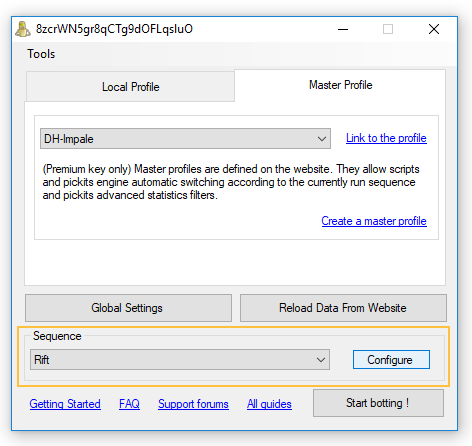 Note: If you don't have a Premium License and therefore Master Profile functionality disabled, you will have to manually enter the settings into the bot, instead of replicating/linking it through the use of a Master Profile. We don't like Molten Explosions or those pesky Grotesque explosions, do we? We need to make sure the bot doesn't either. Or make it walk through them if he's a real tough guy and can handle them. Avoidance is all about how to react to certain mobs, or their affixes like Arcane, Orbiter, etc. It differs from build to build, script to script, character to character, so as with everything RoS-BoT it can be heavily tweaked. For now, check your chosen script's description for a link to the Avoidance recommended. Click it and replicate it to your account. We all love loot, don't we? But we don't love all loot. As a way to filter and direct what the bot picks up or ignores, what it stashes or salvages, the bot looks to the Pickit script. Only want to Keep Ancients? Only primals? Throw away a Traveler's Pledge if it doesn't have the trifecta perfect roll? Never pickup Common whites? Pickit is highly configurable. For now, start with a wide configuration. You can finetune it as you go along. Look under Pickits (web, left menu) to find one. Link or replicate (recommended) it to your account. Gambling is automated and you define what to gamble, and when to do it. 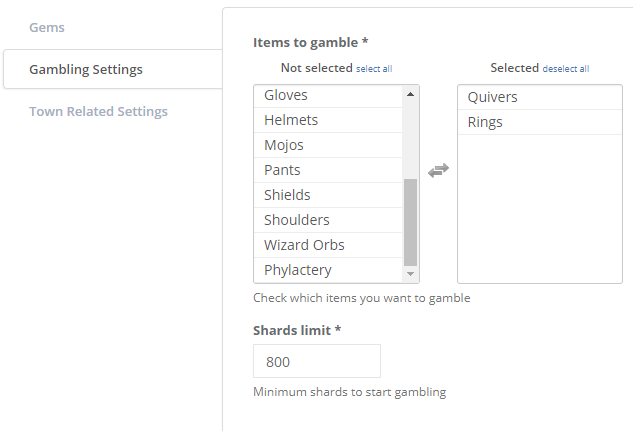 You can for example set it to only gamble rings, and wait until you have X blood shards until it gambles. You can set it to gamble multiple types and it'll evenly do so. See more regarding this below on "Master Profile". Master Profile is only available to those with a Premium License. It's a great tool giving you a 1-click switch between setups for different characters, the ability to run different avoidance/fastmode/pickit settings for normal Rifts compared to Greater Rifts, or Bounties for that matter. Just a few examples on why this is such a great feature. There are plenty. With a master profile, you change almost everything in the bot from the web interface. It's time to create your first Master Profile. Go to My Account -> Bot Profiles. Fill it out according to your chosen Script's linked Master Profile. All the necessary pickit/avoidances/fastmode settings should be available from when you linked or replicated them earlier in the guide. If you miss something, go back to the Script and check the linked Master Profile again. It's important that you fill out all fields in this step. No empty selection fields. 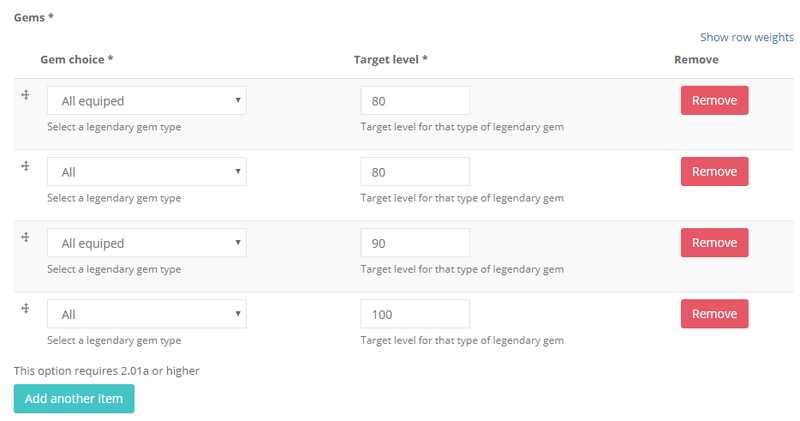 In the Gems section, set how you want the bot to prioritize upgrading your legendary gems after finishing a Greater Rift. 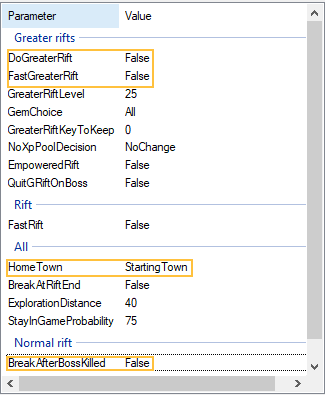 You can chose broad rules or set specific gems. The top conditions will be met before moving down the list to the next condition. In the example all equipped gems will be upgraded to 80 before starting to upgrade non-equipped gems to 80, and after that start upgrading equipped again to 90. The gambling section is really very simple. Just pick what you want to gamble from the list to the left, and set Shards limit to whatever number of Shards you want bot to have before gambling for gear. 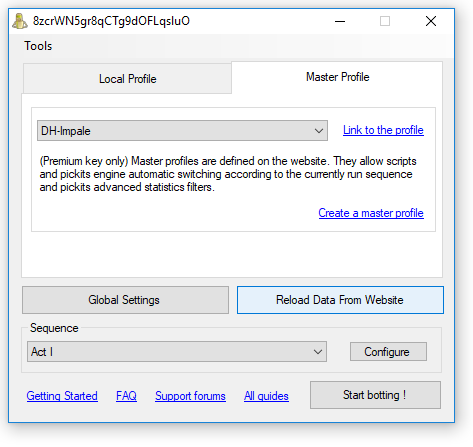 Save, and you've now created your first Master Profile! 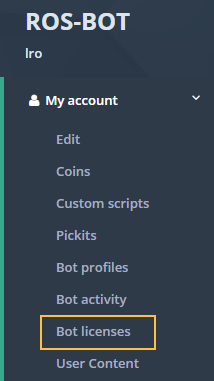 Whenever you make changes through the web interface, whether it be for example in a pickit or avoidance script, or even in the master profile itself, you will need to make the bot go fetch these new settings. In the bot UI, click the "Reload Data from Website" button. Under the Master Profile tab up top in the bot UI you should be able to see the Master Profile you created. Select it. Change Sequence to Rift, and click the "Configure" button. Change "Do Greater Rift" to "True" if you want the bot to run a Greater Rift if he has a key in stash or inventory. Change "FastGreaterRift" to "True" if you want the bot to run the Greater Rift with Fastmode activated as long as its conditions are met. Change "Starting Town" to your favorite Act. Change "BreakAfterBossKilled" to "True" if you want the bot to portal back and close the Nephalem Rift (not Greater Rift) after killing the Rift Guardian, instead of clearing out the whole rift of mobs before going back. You should be all set to go if you followed this guide, so hit the "Start Botting" button and enjoy! “F1” toggles between extra overlays. When in need of help, and you've tried with the above help or by other guides or posts on the forums, talk to us in the #support channels on the RoS-BoT Discord.